This year at Gothcon (an annual gaming convention in Gothenburg) I teamed up with a friend of mine, Magnus, to do a Bolt action scenario. At the time when we started to plan the scenario we were both commited to painting the units for a campaign from the skirmish Campaign series: Monty´s EPSOM, so it felt natural to use that book as inspiration. After some discussion we decided to use the scenario "Royal tanks". It´s different than many other of the scenarios in the series as it is a meeting engagment, so neither side is defending. This we thought would make a great scenario as an introduction to Bolt action. It pits parts of the 15th Scottish Division against elements of Kampfgruppe Weidinger somewhere between Caen and Villers Bocage. Our first time trying the scenario Magnus (Scotts) and I (KG Weidinger) played against each other, in which the Scotts came out as a winner. In this we used proxies so Magnus had three Churchills instead of the two shermans and one firefly that we used in all other tries and at Gothcon. (Mostly because the Churchills arrived so late that there was no time to paint them.) Lessons learned was that the bridge works better if it blocks line of sight, otherwise the road really becomes a dangerous place to be at. The first time we tested the scenario with us as "gamemasters" was the weekend before Gothcon and it was really useful as we defined the rules for the 'blindes' we wanted to use. I´ll write about those rules under the Bolt action rules page later. We wanted to do a briefing for each side so we asked our friend Dennis Gustafsson (his Viktor Kasparsson albums is highly recommended!) 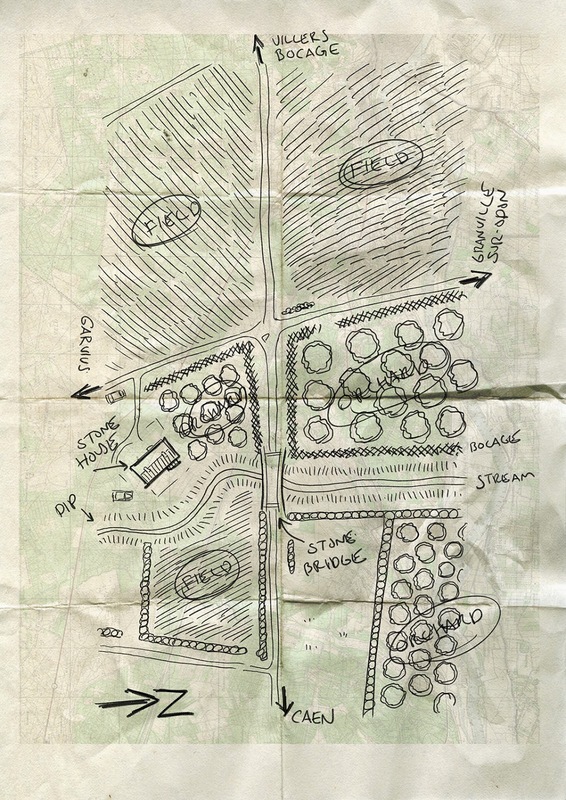 to make a map as it would have been drawn by a reconnaissance unit at the time. The germans arrived from the west table edge and the british from the east edge. Get one tank and 10 infantry of the north table edge west of the bocage. We started the first game with Frederick taking control of the British forces and Martin the germans. Frederick put alot of effort on breaking through so he put two shermans with one infantry unit riding on each. This did really became evident around the house and bridge in the later part of the game as the germans didnt face much resistance. Frederick did manage to claim his main objective, but in doing so he couldnt hinder the germans from controlling the bridge and the house. german command and Håkan and Simon the british equivalent. The bitish side had a more defensive strategy in this game, building up a defensive line just beyond the stream. In this scenario the british players had support of a battery of 25lbs. The AOP tried hard to range in the artillery but when he finally did, disaster struck and bombardment started rainging down on the british lines instead of the germans. Neither managed their main objective, but the germans had taken the house. how to achive their goals and reacted to what happened in game with the objectives in mind at all time. Almost everything the germans did in the first part of the game succeeded until disaster struck, and the AOP managed to range in the mortars on one of the german halftracks blowing it to pieces and taking out the most of the passengers. A bit dazzed the german command continued, just to see that same thing repeated the next turn. The second halftrack destroyed with its passengers. But they managed to stay in the game by being bold with their panthers, which won them the game but also the first destroyed panther the hollow weekend! Both me and Magnus enjoyed this a lot! As we had blindes and some random units we both were in dark about the other side, which made it very entertaining to watch. In hindsight the scenario is probably a bit favored to the germans (as I was the only one who lost as germans in all games we played!). The panthers did scare everyone, and all that looked at the game commented on them. And sure the british tanks were Churchills and maybe thay would have survived better against the panthers but they would have done much damage. Maybe we have to try it again when Magnus has painted his Churchills. Thanks to all that participated! And now some pictures. It was great fun playing, and I realy enjoyed the blinds it made the game go to another level of realism :-).